Before we dig into today’s lesson, we just want to take a second to recognize what an awesome job you’ve been doing so far! Whether you’ve been on the streets for three days or three months, you worked really hard to get where you are—and the fact that you’re following along with the “How to Run a Food Truck” series shows just how committed you are to making your business as amazing as it can be. So, way to go! Since this month’s unit is all about navigating your first few weeks out on the streets, we’re covering a lot of ground. In our first lesson, we explained how to train your food truck employees, and last week, we talked about improving your presentation skills through clever plating techniques. Today, it’s time to move on to a super important lesson that will serve you well throughout every truck stop you make in your entire food truck career. That’s right! We’re talking about updating your location so that hungry customers can find you easily. Let’s start out by getting right to the basics—why updating your location and sending it out to your fans is much more effective than just showing up somewhere. Does a food truck exist if no one knows where to find it? We don’t mean to get too philosophical with you here, but let’s be honest: there’s no point in operating a mobile eatery if people never know where you are. Sure, some people will just happen across your truck on the street, and others might get used to seeing you in a particular location—but if you’re not regularly sharing your location with fans, you’re missing out on a ton of potential traffic. Sending out consistent location updates is especially important to you as a brand new food truck owner. We strongly believe that every food truck can benefit from updating their location regularly (even big-name trucks will get new customers who seek them out so they can find out what all the buzz is about), but location updates are absolutely essential for small trucks who are just starting out. See, as a new food truck owner, the bulk of your business is going to come from a.) people who come across you on the street and b.) repeat customers. You can only control the number of walk-up customers you get to a certain extent, because passing foot traffic is ultimately dependent on the quality of your location. However, developing a fan base of loyal customers who seek your truck out on their own is really where food truck success is at. Your goal as a new food truck owner is to wow new customers with your food, to forge connections with them and show them how much you care about service, and to give them a reason (or three) to come back. Once fans have a reason to come back, they only need to know where you’re heading so that they know where to come back to. That’s where location updates come in. To make the most out of your updates, let’s learn about how to time them and what they should include. Location updates keep fans informed of the latest spots they can visit to snag one of your tasty tuna wraps or your savory Simple Squash Soup. However, simply telling fans, “We’re serving downtown today!” isn’t good enough. They want more details on where you’ll be, when you’ll be there, and what you’re going to serve. It’s important to give customers as much information as possible so that they know how easy it will be to get to your truck and whether or not they’ll find what they want when they get there. There are few things more disappointing for a food truck fan than to trek out to the location the truck said they would be at only to find that they just packed up shop and are heading home for the day. You don’t want to let your fans down, so give them all the information they need in advance. That also includes telling them about your upcoming truck stops early enough that they have plenty of time to make it to your location. There’s no hard and fast rule for how early you should send out a location update because the timing will vary for every truck based on your audience and the city you’re serving in. If your fans are primarily made up of downtown workers who will walk a few blocks to your truck on their lunch breaks, you can let them know where you’ll be about 30-60 minutes before you show up. On the other hand, if your fans are spread out across the city and might need to drive to an event where you’ll be serving, it’s better to give them a few hours (or even a few days) of advance notice so that they can plan their schedules accordingly. Updating your location frequently might sound like it’s going to be a lot of work, but fortunately, it doesn’t have to be. There are plenty of ways to minimize the amount of time you spend on location updates and to automate the process of adding new stops to your schedule. Read on to learn about a few of the most convenient ways to tell fans where you’re going next. How do most people find their favorite food trucks? Sometimes they happen across them on the side of the street. Sometimes they use an app to find out what trucks are in their area. And sometimes they catch a post on Twitter with a particular truck’s upcoming schedule. Though there all kinds of ways for hungry customers to make it to your ordering window, we think it’s important to make the process as simple as possible for them—which means readily offering your location through as many avenues as you can. Chances are that most days you’ll end up getting customers from a variety of sources. There’s no single way that all your fans will come to you, so it’s essential to reach out through multiple channels. By making your location readily and consistently available, you make it easy for your loyal fans and brand new potential customers alike to make it to your truck before the lunch hour ends. We recommend using all of the following three location update strategies to spread the word about your next truck stops. First things first: Your website should absolutely have information on your upcoming schedule. Ideally, we like to see trucks list out a month’s worth of locations at a time—but if that’s not possible, you should at least have your schedule for the next week posted. There are a ton of different ways you can add your schedule to your website, ranging from integrating your Facebook and Twitter feeds to installing a Google calendar to manually typing up the information each week. The particular method you choose doesn’t matter as much as making sure you keep it updated regularly. It’s okay to have a few old dates on the schedule if you’re posting a week or a month’s worth of locations at a time, but there should never be a point where a customer goes to your website and isn’t able to see where you’re going to be today or in the next week. For that reason, we recommend using a calendar or social media feed integration tool that will automatically update so that you don’t have to remember or take the time to make updates yourself. Now, we know that some of you might not always know where you’re going to be in advance. Cities with tough parking laws sometimes make it challenging to plan out your schedule, and your exact location may be subject to where you can find a large enough open space on the day you’re serving. However, you can still post a location calendar on your website that simply explains what days and times you’ll be serving and then giving customers information on how to find the specific location at the time. For example, you can let customers know that you’ll be serving every weekday from 11am to 8pm and on Saturdays from 12pm to 6pm, with time set aside on Sunday for catering events. Then, include a link to your Twitter page and explain that they can get up-to-the-minute updates on your latest locations by following along. Social media is a quick, easy, and convenient way to keep fans updated on your location. Because it’s one of the most popular ways for food trucks to communicate with their fans, many people will already expect that they can head to your Facebook or Twitter page when they want to find out where you’ll be next. People following you on Facebook or Twitter are interested in your location. If you’re feeling hesitant to hit the “send” button on an update that tells people where they can find your truck, remember this important fact—anyone who is following you on Facebook or Twitter chose to do so and is interested in learning where they can find you. Your fans chose to follow you because they love your truck and they want to return again. Don’t be afraid to promote your schedule. Your messages need to stand out. With that said, it’s also important to keep in mind that people are bombarded with messages, images, and links every time they log on to Facebook or Twitter. Even though your fans want to know where you’ll be, you’re going to have to find a way to set your location updates apart from the rest of the crowd if you want the posts to get any attention. We’ll cover more social media strategies in the future, but for now, be sure to check out this FoodTruckr lesson to learn more about what and when you should post. Send multiple updates. Though you don’t want to inundate your fans with repetitive messages and overly self-promotional content, we do recommend sending out multiple updates when you’re heading to a new location. Your mileage may vary, of course, but an average sweet spot for most trucks seems to be about two or three updates per new location—one post telling people where you’re going next, and a second (and possibly third) one once you’ve arrived. Use these additional updates to either announce that you’ve arrived at the new location or to let people know mid-way through your shift how much service time is left). Updating your location through social media and your website are definitely the first steps for any new food truck owner—but using food truck location apps is the next level. If you want to take a professional approach to letting fans know where your truck is going, these apps should be a part of your strategy. How do apps tell fans where your food truck is going? Well, many of the most popular food truck apps work by either pulling data from the updates you’ve already shared on social media or by allowing you to check in with your latest locations. Though some apps automatically track food trucks, many others require you to opt in and request to be added to their directories. The greatest upside to apps that help customers find food trucks is that you can reach people who have never even heard of your truck. With that in mind, we recommend participating with as many of these apps as you can so that your location will be readily available to even more potential new fans. Do be careful not to sign up for too many that require you to check in daily or to spend a lot of time using them in order to have your location published. For the most part, using these apps should be a pretty automated process that you won’t have to think about for more than a few minutes each day. Here’s a list of popular food truck location apps to check out (as well as a couple regular apps that you can use to update your location through Facebook and Twitter). Please note that some of these apps may not be available in all locations. If you’re interested in learning more about how food truck location apps work and what benefits they offer for brand new FoodTruckrs, be sure to check out our podcast with Matt Berkland of Truckily. While some trucks can definitely subsist on foot traffic alone, most food trucks need to make good use of location updates in order to keep fans coming by. 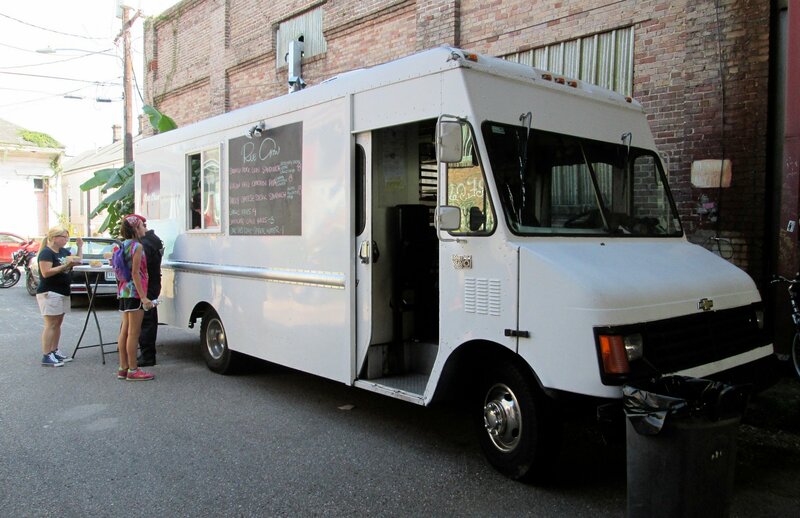 Updating your location regularly helps you stay on your fans’ minds and allows you to connect with customers who are hungry for their next food truck fix. Making use of your website, social media pages, and food truck location apps allows you to reach a wider audience and bring more people to your ordering window. Coming up next week: We’ll cover a few of our favorite apps that help FoodTruckrs run their businesses more efficiently. If you’re looking for some convenient tools to simplify your life, be sure to stay tuned for Lesson 04! In the meantime, we want to know what format you’re using to share your location with fans right now. Have you been relying on walk-ups or are you promoting your upcoming schedule through another channel? Do you know of a fantastic food truck app that other FoodTruckrs absolutely must know about? Share your favorite location update strategies in the comments below or on our Facebook or Twitter pages.